Bruno was born in Cologne around 1030. He was still a youth when he was sent to Rheims, in France, to study at one of the most reputed universities in Europe. After completion of his studies, he started teaching at that university. In 1056, Archbishop Gervais chose him to be the Rector of the "schools" of Rheims; he held the office of Rector of studies for 20 years. Towards the end of 1076, Bruno chose exile because of the conflict between Manasses of Gournay, the archbishop of Rheims, and several important institutes of the city, including the Benedictine monastery of Saint Remi. On December 27, 1080, Gregory VII had to resolve to ask the clergy of Rheims to drive the corrupt archbishop away and to elect a new one. Bruno was chosen for this post of high responsibility and power, one of the highest ecclesiastical positions in the kingdom of France. But he had other plans. He had decided to follow Christ to the desert. It is only around the Feast of St John-Baptist, approximately on June 24, that he and six companions reached the far end of the desert of Chartreuse, under the guidance of Hugh, the young bishop of Grenoble. For six years, Bruno was able to enjoy the life he had chosen with his brothers. In the first months of 1090, Urban II, a former student of his, summoned him to Rome to help him in the service of the Church, but just a few months later, Bruno obtained the Pope's permission to return to eremitic life, provided that he would establish his hermitage in southern Italy, then under the rule of the Norman princes. Bruno chose a vast desert in the diocese of Squillace : Santa Maria della Torre. This is where he died, on October 6. 1101. 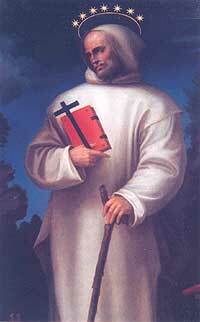 From there he wrote two letters full of tender love which have been inspiring Carthusians for nine centuries. Bruno was beatified by Pope Leo X in 1514. - Biography of Bruno by Fr André Ravier, s.j. The twelve chapter titles below are links to the main chapters of André Ravier's (1905-1999) biography of Saint Bruno : André Ravier, s.j., Saint Bruno The Carthusian, written in 1981 and translated by Bruno Becker, O.S.B., Ignatius Press, San Fancisco, 1995. These extensive excerpts (almost the complete book, slightly edited for web purposes and updated, but without the footnotes and index) from the pen of a writer who wrote so many books on Carthusian history and spirituality are included here for their inspirational value and for a fuller understanding of Bruno's soul through his historical circumstances. It is an important read for an admirer of Bruno and for any serious student of the Carthusian Charism. The book is out of print; it is reproduced here with the kind permission of Ignatius Press.